A powerful coda to what many considered the best show on TV recalls "Homicide" at its best: prickly character tensions, sour office politics, raging emotions, and the camaraderie of the squad room. 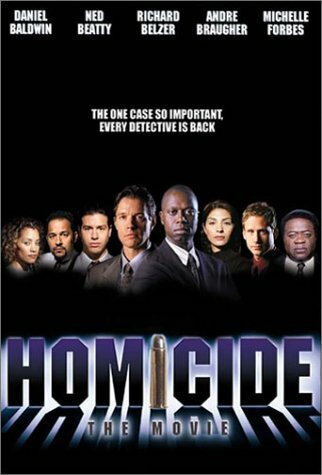 In "Homicide, the Movie" that squad room becomes unusually crowded when the entire cast, past and present, converges to hunt for the gunman who shot beloved former shift commander Al Giordello (Yaphet Kotto), now a controversial Baltimore mayoral candidate.\n The class reunion could have easily turned into a gimmicky series of cameos, and with such a sprawling cast many familiar faces are indeed little more than walk-ons, but the fiercely intelligent script anchors the investigation in the even more anticipated reunion of the tetchy, intense retired detective Frank Pembleton (Andre Braugher) and his former partner, Tim Bayliss (Kyle Secor). Never quite friends yet intimately trusted partners, the relationship of the most compelling duo in the show's history is pushed to the brink as the morally sure Pembleton digs around the guilt that haunts Bayliss in a devastating climax. All the hallmarks of the show are here--the vivid location shooting, the nervous you-are-there camerawork, the effective use of popular music--and the episode comes full circle in a lovely coda in which even the deceased make their appearances. It's an uncompromising piece of American television and a moving end to a great series. " --Sean Axmaker"